No my lord, it’s a revolution ! 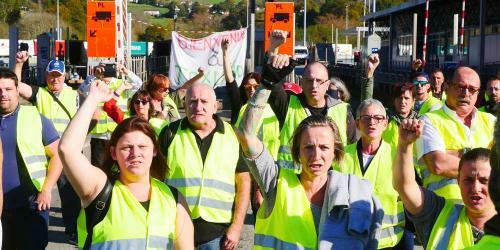 The working class in the protest of yellow vests : abolition of all indirect taxes ! It’s not Macron, it’s the street that changes the climate ! Yellow vests : workers’ committees everywhere ! Finished, outdated, impossible, social revolutions, did you say ? !!! 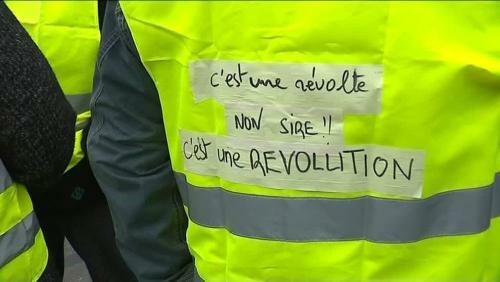 Yellow vests : this is just the beginning, the insurrection continues ! The dark projects of the French rulers : bloody provocation, martial law, military power and tanks in the streets !!! Faced with yellow vests : no police and military dictatorship of the power of Capital against Labor ! We are nothing, let’s be everything ! Enough of misery ! Enough of contempt ! Enough to pay for the billionaires ! No truce ... in the attacks against the yellow vests !!! Unsurprisingly, this treacherous move enraged the union rank-and-file, who have been coordinating with the yellow vests since the start of the movement. The joint statement was immediately and strongly condemned by the local branches of the trade union federations. The CGT Departmental Union 13 (Toulouse) has issued a strongly worded statement denouncing the joint statement from the union tops and saying "we will continue to denounce and fight the real violence which is that of the ruling class against working people." CGT UD 31 from Marseille (the branch that protected high school students from police repression that same week) said that the joint statement “sends a catastrophic message to those [in the] struggle. It puts our activists in danger”, and has called for an emergency meeting of the CGT to hold their leaders to account. The CGT National Federation of Chemical Industries has also rejected the joint statement, saying it is "unworthy of the CGT", and condemning instead "the violence of the bosses, police and trade union repression, as well as reformist complicity." The statement continues : “if there is violence, the cause for it is amongst the ranks of the oppressors not the oppressed… the role of the CGT is to be side by side with the workers and not as an auxiliary of the bosses and the government." The Paris energy sector branch of the CGT has condemned the joint statement, and will join CGT-affiliated transport workers with a 48-hour strike on Thursday. The CGT UD 59 (Lille) is the latest to join in the chorus of protest at the joint union statement, and has also issued a communiqué demanding an emergency meeting of the CGT national leadership. Yellow Jackets Shakes the World … And It is Just the Beginning !